Damiano Caruso is set to move to Bahrain-Merida for the 2019 season. The Italian puts an end to four years at BMC Racing Team. Caruso has signed a two-year contract with the formation. "I’m really excited about this opportunity," he said. "I’ve always considered this team well-organized and well-structured. Moreover, both management and riders have shown interest in me, so when the opportunity came up, it was very easy to find an agreement. I believe this is the right team for me and I think that this choice can be of benefit to everyone. The rider has been playing a supporting role for BMC at Grand Tours and looks forward to being in the same team with a friend from the past. "I rode with Vincenzo Nibali when we were teammates at Liquigas in the seasons 2011-2012," Caruso commented. "It’s nice to be again in the same team. In addition to our friendships, I wish we can build something good together." "My role within the team will be to have my chance for some short stage races and then support the team captain in the Grand Tours." 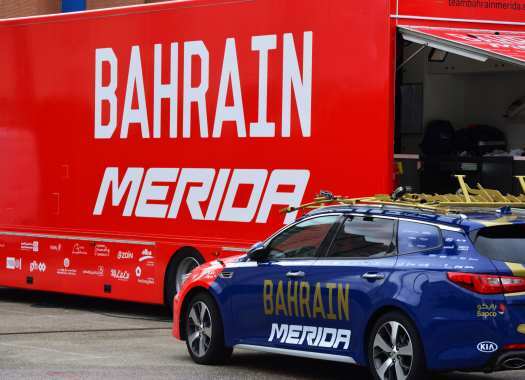 Bahrain-Merida General Manager Brent Copeland thinks this signing brings a solid guarantee to the team. "Damiano covers so many roles on a team which is exactly what we were looking for: He can be a leader when it’s needed as well as been one of the best domestiques in the pro peloton," he explained. "His consistent results and true professionalism is exactly the kind of rider which we felt suited our team perfectly. We are extremely happy to have Caruso on the team and looking forward to some exciting years of working together."